Cut the bell peppers in 1/2 lengthwise. Discard the stems and seeds. Place them in a large bowl, lightly coat with the canola oil, and add salt and pepper. Take 2 baking sheets, line with parchment paper, and then place the red peppers on one, and the yellow peppers on the other, cut side down. Put them into the oven, and roast until the skin blisters but does NOT turn black. About 30 minutes. (They are on separate sheets as we find that the red peppers blister about 5 minutes faster than the yellow peppers.) Remove the peppers and place them into a bowl and cover with aluminum foil. Let the peppers cool until you can comfortably hold them in your hands. Peel them and tear them into strips about 3/4" wide. Tear the Organic Piquillo Peppers into the same size pieces. Put all the ingredients, except the chives, into a medium saucepan over medium heat. Add salt and pepper. Simmer for 30 minutes until the peppers are completely softened. Transfer to a bowl, plate, or platter, sprinkle with chives and serve immediately. I use this on every dish imaginable, I'm addicted!! It is sooo delicious. The perfect addition to salad dressings, I LOVE it on eggs, on chicken, steak, hamburgers... you name it. Bought one as a gift for a foodie friend, she loves it too! 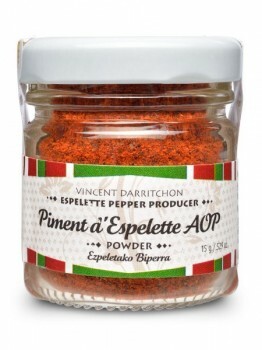 This specialty spice gives your dishes a warm depth of flavor with a nice little kick. It is spicy but subtle. I love it on eggs, chicken, pork, in creamy salad dressings, mayonnaise, and melted butter. It is perfect on seafood (crab salads, shrimp, halibut, seabass) too.... I use it on everything! A must have in my kitchen!! I love this. Get it!! !